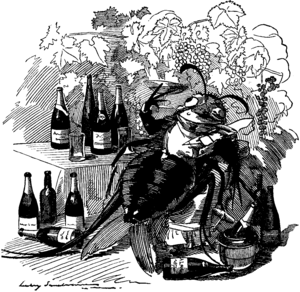 You are here: Home / France / Phylloxera – The Louse that Crashed the Party! Phylloxera – The Louse that Crashed the Party! 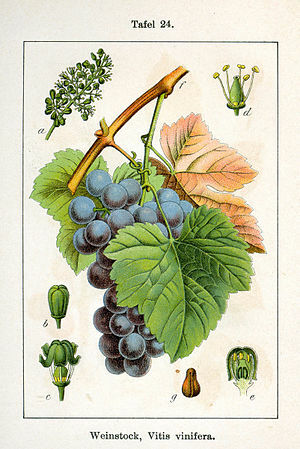 The December 4th, 1863 issue of the British publication, Journal of the Society of Arts, reported that while the quality of the wines from the European continent were of a lesser stature than those of the impressive 1862 vintage, there were nonetheless, as with the reds of Burgundy, a handful of districts that produced wines of at times quite reasonable merit. The Journal, in a presciently ominous observation would go on to say that, “It is to be feared, judging from past experience, that the cycle of good years is complete or near completion…” And, like the Titanic, whose luxurious festivities were to be tragically interrupted by a catastrophic collision with the awesome force of nature, so too would the vineyards of Europe succumb in just as dramatic a fashion. For only a few years prior to the Journal’s report, a tiny band of inauspicious passengers had successfully embarked on a journey across the Atlantic ocean in the opposite direction, unwelcome North American travelers whose devastation would stun the world! The new American nation was a wonderland of enchanting landscapes and novel discoveries. European visitors marveled at the bounty of its vast expanse! Bison roamed the Great Plains by the millions; exotic plant species were abundant as well. Wild, native-American vines captured the attention of some whose fateful decision to repatriate the ostensible bounty to England would prove to be nothing short of calamitous! For unlike its American cousins, the ubiquitous vitis vinifera vine species that blanketed the vast wine lands of Europe was ill-equipped to beat back an almost microscopic adversary that clung menacingly to the American vines. When, in 1863, reports began to circulate that vineyards were dying en masse in southern France, little could anyone have known that within a few short months a vast swath of Europe’s prized viticultural empire would lay in ruin. While the scourge ferociously attacked the vineyards of many European nations, it was particularly devastating to the French industry, decimating a full 40% of all vines! The phylloxera, a true gourmet! The culprit? – a tiny louse of the lowly aphid family known as Phylloxera vitfoliae or Grape phylloxera. This diminutive predator, arguably one of the most devastating threats to the world of viticulture, has a complex life cycle that sees the insect lay a single “winter” egg in the bark of the vine’s trunk that then develops into a nymph. This leaf form of the parasite lays its eggs in a gall that it creates by injecting saliva into the leaf. Then, these root form nymphs perforate the rootstock seeking nourishment and infect the root with a toxin that prevents it from healing. It is this poisonous secretion that ultimately kills the vine. Eggs are laid at this stage as well and lie dormant until summer when the next wave of offspring deploy and continue the devastating process! In a great irony of history, the solution that would ultimately be found to confront the catastrophe of phylloxera in Europe’s vineyards would be that of grafting the non-resistant vitis vinifera vine species to a resistant American rootstock like vitis aestivalis or another comparable host! This solution, pioneered in the latter part of the 19th century by Charles Valentine Riley in collaboration with J. E. Planchon today remains the most effective means by which to combat such a voraciously merciless and intensely metamorphic predator. Like so many dark moments in human history, this destructive chapter is a testimonial to ingenuity and the instinct of survival in the face of overwhelming odds. But for a relentless struggle to overcome a cunningly ruthless foe, the world of wine, as we know it today, would quite possibly be wholly unrecognizable! The dramatic resurgence of vitis vinifera from the ashes of near extinction presents a narrative that is quintessentially uplifting. It is one that underscores our conviction that when creative and determined minds tackle even the most daunting human challenges the outcome frequently incites admiration even awe, inspiring us all – uh, unless we completely louse it up! I am not an insomniac. However, in nights like this when, for reasons yet to be understood by either myself or specialists in the medical field, every now and then I simply cannot fall asleep I take advantage of this quiet time to read a few pages of my favorite book or journal while sipping on a glass of my favorite wine. Pondering upon this brief passage, I couldn’t help but to wonder the marvels of human innovation and imagination at the sight of adversity. How many times have Mother Nature presented us with these types of challenges? Almost as if she was playing some sadistic, yet educational game with the human species. I am sure she feels proud when fellows like these two prove their worth and meet or even exceed her expectations by creating new strains of grapes that enable us to produce interesting varieties of wine. So, I toast to her (at 3:30 in the morning) wondering what new challenges she has in store for us… cheers!